• Explain in your words what an SAE project is and what this means to you. Colf: An SAE project is a responsibility you have that prepares you for future careers. To me, an SAE means working hard. • What is your SAE? Colf: My SAE is taking care of rabbits and equipment at Mr. Epperly’s farm. • What about your SAE interests you? Colf: Being able to work on a production farm interests me the most about my SAE. • How can this opportunity help in your future? Colf: This SAE can help me in my future by teaching me how to work hard in a job setting. • What have you found to be your greatest strengths and weaknesses through your SAE? Colf: I’ve found my greatest strength is working hard and my greatest weakness is scheduling. • Has this experience helped you make decisions regarding your future career? 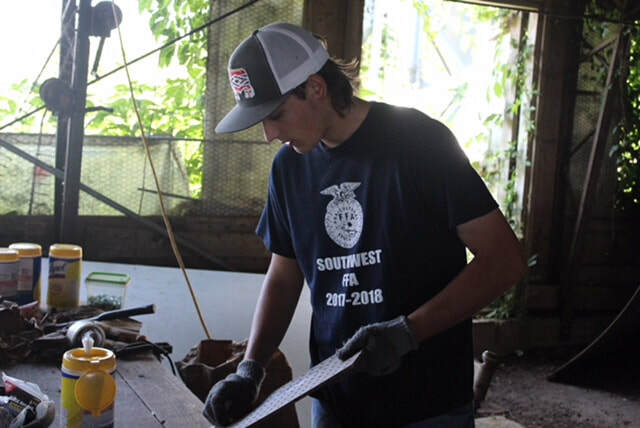 Colf: This experience has shown me that I definitely want to work in a career that allows me to deal with farms.